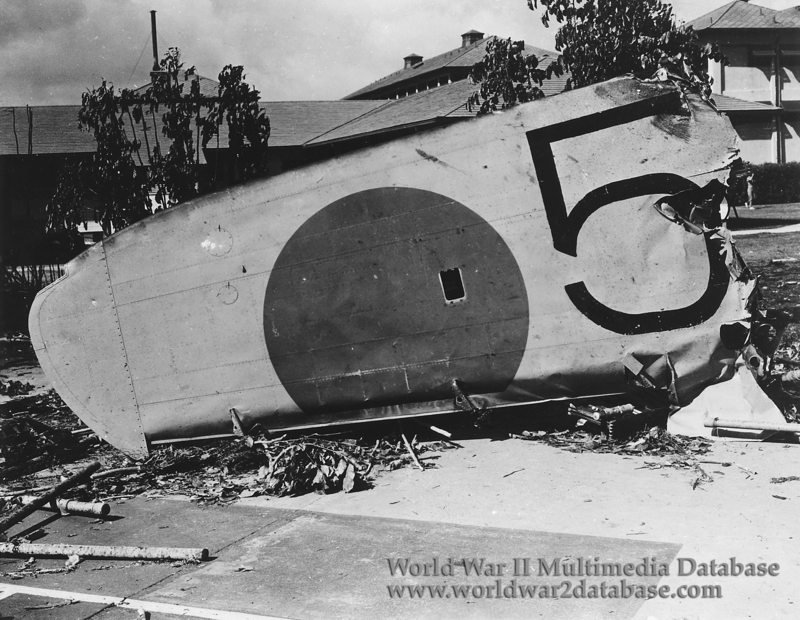 Wing of a Japanese Navy Type 97 Nakajima B5N2 carrier attack aircraft that crashed at the Naval Hospital, Pearl Harbor, during the attack. This plane came from the aircraft carrier IJN Kaga and had the tail code AII-35?. Its "Rising Sun" insignia was later largely cut away by souvenir hunters. AII-35? was piloted by Airman First Class Airman First Class Syuzo Kitahara with Observer Petty Officer Second Class Yoshio Shimizu and Gunner/Radio Operator Petty Officer Second Class Haruo Onishi. The third B5N2 to attack USS West Virginia in Kaga's first wave, Kitahara's plane was hit multiple times by incendiaries that severed his fuel lines. He broke off his attack as his plane caught fire; Onishi jumped without a parachute, landing near USS New Orleans (CA-32) and USS San Francisco (CA-38). He was recovered from the water alive but soon died of his injuries. Kitahara, struggling with his burning plane, avoided the Navy Yard's large Hammerhead crane and flew down the length of 1010 Dock. Observers noted the burning plane's hydraulics failed and the landing gear began to lower. Kitahara, probably unable to control the plane any more, headed for the Naval Hospital. Captain Reynolds Hayden (September 30, 1883 - February 5, 1952) Commanding Officer of the Naval Hospital, later wrote Kitahara seemed to head "directly towards the front of the main hospital building." Kitahara stood up and let go of the controls just as the plane veered to the left and crashed between the laboratory building and the Chief Petty Officer's quarters. Hayden noted the two Japanese officers were dead, their dismembered bodies strewn across the crash site. An angry Marine began screaming he would kill the Japanese, while holding the dead man's leg. He realized what he was doing and took the man's boot as a souvenir. Private First Class Marion M. Milbrandt, summoned to the Naval Hospital grounds with his 1,000-gallon water pumper, fought the resulting fire. The fire, fed by the crashed plane's gasoline, threatened the facility, but Milbrandt and his crew controlled the blaze. The Hospital laboratory was severely damaged and some research animals were destroyed. The Japanese lost five B5N2 bombers from Kaga during the first wave. Special thanks to David Aiken for his research on the crew of AII-35?.